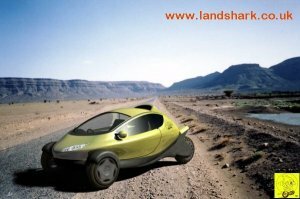 On land the Land Shark would travel as a conventional 3-wheeler but when in water the front mud guards will rotate under the wheels and the back wheel would have powered the vehicle with an inbuilt propulsion system in the rear wheel that acts as a turbine pump sending the vehicle forward hydroplaning on its lowered front mud guards. Both Lotus Engineering Ltd and D.E.R.A. 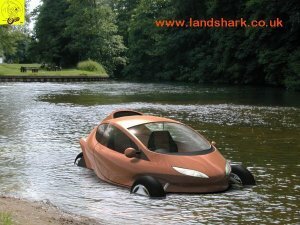 (Defence Evaluation Research Agency) were involved with the Land Shark agreeing to handle the Research and Development stage as well as constructing the speed prototype.